The Air-Spade is a hand-held soil excavation tool connected to a large air compressor. The high pressure stream of air is funneled through a small nozzle breaking dense soils apart into small particles. By using air to excavate soil, delicate roots, underground pipes, and hard surfaces are not damaged. 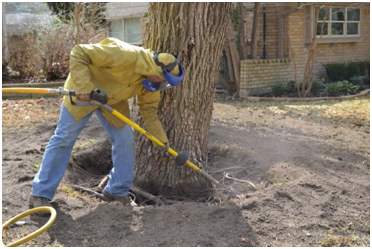 Arborists can recommend using the Air-Spade for many reasons. The root flare or root collar is the area where a tree begins to taper outward at ground level. This is a critical part of the tree where trunk tissue changes into root tissue. If this area is covered with soil and kept moist for extended periods of time, the tissue begins to breakdown. This leaves the tree vulnerable to root decay and ultimately poor health and vigor. Base investigation is needed when an Arborist suspects deterioration of root tissue. Since roots cannot be seen above the surface, the only way to confirm this suspicion is to excavate the soil and inspect the root structure. Clearing root flares for Macro-Injections is another common use for the Air-Spade. Macro-Injection is an application method used to apply chemicals for disease/pest management and for supplemental nutritional needs. Soil and debris are removed quickly and easily without damaging the tree or its roots. The Air Spade is a tool that can tell the arborist if the grade has been changed around the base of a tree. Soil that has been added around the base of a tree can have a negative effect on the tree’s health. An exposed root flare can be examined to determine if structural roots show signs of decay or if there are any girdling roots. Decaying structural roots can lead to tree failure and Girdling roots can damage the trees vascular system and restrict the uptake of vital water and nutrients. At A.B.C. Consulting Arborists LLC we believe in giving you the highest level of tree solutions possible as many tree related health issues begin in the ground and/or roots your consultant may recommend the use of the Air Spade to properly diagnose these as well as many other tree health issues. Already Have an Idea of What Service You May Need? Schedule a Consultation. Thank you for contact us, we will get back to you very shortly.